While this is a convention resort and as such it can play host to large numbers of people, its moderate price level means that the gatherings tend to be businesses rather than high school cheerleaders or other sports teams. Those groups tend to choose value accommodations like the All-Star Resorts, so you’re not as likely to encounter the kind of noise at Coronado Springs that you’ll find elsewhere. Also, if you happen to visit when they aren’t hosting large groups, this resort can feel downright intimate. It’s possible to make it from the resort bus stop all the way to your room without running into a single other person when returning from the theme parks on those nights. Further, the Coronado Springs rooms are divided up into three villages named Casitas, Ranchos, and Cabanas around a 22-acre lake called Lago Dorado. This means that you can have a large group staying in one village but not even be aware of them in the other villages. Even though it is a convention resort, make no mistake – families and couples will be very comfortable here and enjoy their stay quite a bit. The more peaceful surrounding will simply ensure that couples feel like they are getting more privacy, and families will appreciate the fact that they can occasionally hear themselves think when sharing time together. Coronado Springs is themed to the American Southwest and northern Mexico, and the decorative touches are everywhere. From the lobby and dining facilities in El Centro (the main building area) to the property exteriors, from the fountains around the property to the room décor, the atmosphere of the resort truly reflects those locales. And be sure to look for the topiary versions of Donald Duck, José Carioca, and Panchito Pistoles – The Three Caballeros from Disney’s 1944 film of the same name – in the Casitas village, as well as Burrito the flying donkey in Panchito’s Gifts and Sundries in the main building. One of the great things about staying at a resort themed to the American Southwest and northern Mexico is that the food is excellent as well! Coronado Springs has a number of dining options to choose from. Disney divides these options up into three categories: quick service, casual, and unique/themed dining. While they lump three individual places together as quick service dining, Pepper Market, Siestas Cantina, and Café Rix could not be more different from one another. Café Rix is a quick, walk-through shop where pastries, fruit, salads, desserts, tea, and smoothies are offered. Siestas Cantina is the poolside bar and grill that serves breakfast and lunch, including eggs, bacon, waffles, and hash browns for breakfast and nachos, wings, tacos, burgers, and empanadas at lunch. It also has a bar serving signature cocktails, frozen drinks, margaritas, and sangria. Pepper Market is the large indoor food court that offers a wide assortment of items for breakfast, lunch, and dinner in an open air market setting. The chorizo hash and poached eggs at breakfast were particularly good. The Yucatan roasted chicken and cheese empanadas served later in the day were also excellent. Las Ventanas is the a la carte casual dining option here, now serving breakfast, lunch and dinner. Items of note include their omelets, chipotle BBQ pork, crab cakes, and blackened Mahi. The Maya Grill presents unique/themed dining at Coronado Springs, serving up Tex-Mex cuisine during dinner hours only. Follow the house guacamole with Maya Grill’s signature fajita skillet and then finish with the coconut flan and you will not be disappointed. Each village at Coronado Springs features a leisure pool that offers a quiet place to relax and swim that will appeal greatly to adults seeking some time away from the ever-present children at Disney World. And the reason that the leisure pools are so quiet is that most of those children will want to swim at the Lost City of Cibola Pool at the Dig Site in the Ranchos village. A 50-foot high Mayan pyramid with water spilling down the steps is the centerpiece of the pool area, which also features a 123-foot long water slide. A kiddy pool, playground, and arcade are also here, serving to preoccupy children while their parents enjoy the largest hot tub on Disney World property! The Dig Site can be reached fairly easily on foot from Ranchos or Cabanas, but guests staying in Casitas may wish to make use of the theme park and Disney Springs buses circling the resort to get here rather than make the long trek – particularly with young children. The Coronado Springs staff can direct you to the bus you need. After a long day in the parks, what better way is there to unwind than to stop by one of the two lounges that Coronado Springs has to offer? Rix Lounge is a comfortable and relaxed indoor lounge located in El Centro. Along with a number of finger foods and sandwiches, they serve an excellent assortment of margaritas and mojitos as well as specialty drinks, wine, and champagne. The hours listed were 5 PM to midnight every day. Weather permitting you might want to try Laguna Bar, their lakeside outdoor lounge. They serve signature cocktails, margaritas, sangria, and frozen drinks. I highly recommend the Margarita Fiesta, which is a frozen margarita with mango, strawberry, and lime layers. Absolutely wonderful! The staff here is attentive and friendly and you simply cannot beat the view from the lakeside tables. The Laguna Bar is open from 11 AM to 11 PM every day. What Disney resort would be complete without the requisite gift shop? Panchito’s Gifts and Sundries is a large store that has a little bit of everything and you’ll definitely want to stop in and take a look, especially since some of the merchandise is resort specific and you’ll want a reminder of your time at Coronado Springs! They have native crafts, clothing, hats, pins, jewelry, plush toys, home goods and many other items. The “pantry” section has breakfast foods, snacks, sweets, soft drinks, juice, milk, beer and wine, toiletries, and nearly anything else you might need while away from home. 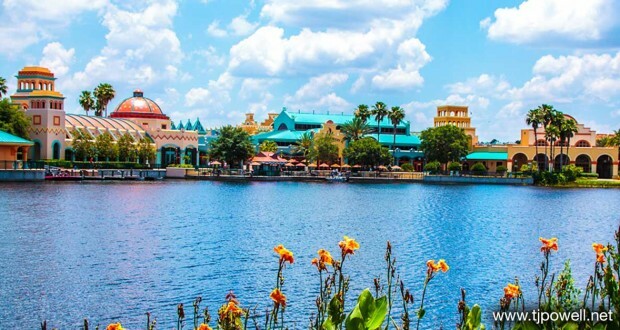 If Disney’s Animal Kingdom is your favorite Disney theme park, Coronado Springs is perfectly located to ensure that you get an early start at that park. And with Pandora – The World of Avatar set to become one of the most popular areas in all of the Disney parks, this resort seems poised to become very popular among those seeking a moderately priced resort close to their Na’vi friends. Despite the “convention resort” label, Coronado Springs is an excellent Disney Resort property that has appeal for couples and families as well. And needless to say, it is a great option for your company’s next seminar or retreat to the Orlando area. Have you enjoyed a visit to the Coronado Springs resort? What was your favorite part of your stay? Don has a huge passion for All Things Disney, and is fortunate to be the husband of a Disney-obsessed wife and father to five Disney-loving children. A former TV writer in Los Angeles, Don visited the Disneyland Resort several times a week as an Annual Passholder before moving to Orlando and becoming an Annual Passholder at Walt Disney World as well. He finally gave in to his passion and became a Disney World Cast Member, working his way up to Disney Trainer in the Transportation Department where he worked for three years. Don is excited to share his love and knowledge of Disney here on DisneyFanatic.com!